Minasunda began the speaker session with the parties planned for this month’s festivities. On April 21, D’ni new year 9675 (heeborah naygahbreesee, in D’ni), there will be a party and a Yoda Light Show in Mir-o-Bot’s Eder Tsogal at 13:00 KIT. To get there, PM “link” or “meet” to the bot (KI# 32319). Seeker will provide the music. The next day, April 22, is the International Mother Earth Day, and it has become a tradition for the Nulp Dance Group to host a show, also with a Yoda Light Show. To get to the location, PM Mir-o-Bot at 13:00 KIT. Seeker will provide the music. arrive on time before the show starts. The dancers will be very busy during the show, so they will not be able to answer questions; volunteers are welcome (please contact Minasunda). Of course there will be rehearsals. If you do not want the surprise spoiled, avoid linking to Mir-o-Bot if he is with five or more people until the show. If you do, please keep quiet and do not use magic commands. And keep the secret! For further updates (and videos, after the shows), check the MO:ULa forum posts (New Year, Mother Earth Day) by Minasunda. rarified announced that he managed to restore the proper behavior of the OpenUru.org testing shard Minkata. This month he has been working hard to deploy Minkata-alpha, the second shard planned for testing fan content. Bringing up the new shard has required some changes (fixes) to the game client, as well as bringing up a second server. There is no fan content there yet, but rarified is This Close™ to ask Doobes for a current copy of the New GoMe Pub, to start working with that. There are also a couple of changes that have to be brought over from the H’Uru client code base in order to use content generated with the current Korman plugin for Blender. A wide-open test for Minkata-alpha might happen soon. Once fan content works there, they will be working on a process for submitting it to Cyan for their approval and hopefully integration into MO:ULa. The New GoMe Pub probably will not be the first fan Age to appear there, though; Cyan prefers to have a bridge (such as the fan Nexus) in place first. There are a few projects nearing completion for that purpose, so stay tuned! Korov’ev then mentioned the Kickstarter everyone is talking about: Firmament! It got 40% funded in the first week or so (you can follow a live projection if you enjoy anxiety), but the more funds it gets the better, so if you have not backed it yet, it is time! The game is being developed for VR first, but it will work fine as a classic PC game too. Unfortunately, support for macOS is not planned for the Kickstarter. Cyan is working on it, but for now it will be for Windows only. The release is currently planned to be on Steam, GOG, Viveport, and Oculus Store. Regarding the Myst25 Kickstarter, the eBook novels and the Riven digital map rewards for the Writer tier have not yet been released, and there is no estimate of when yet. Also, the Fangamer coupon has been extended: you now have until April 30 to use it. Fangamer also confirms new items will be available soon. If you were at PAX East or Indie MegaBooth, Cyan showcased Firmament and ZED there, respectively. Mass Mysteria is coming on May 4 in various locations around the world (which also means that the next All Guilds Meeting is postponed to May 11). Registration and hotel reservations for regular Mysterium are now open! The location will be the Ruby River Hotel in downtown Spokane, in walking distance of the downtown core and Riverfront Park, and overlooks the Spokane River. The Committee has secured a rate of $119/night for one-bed rooms and $129/night for two-bed rooms (plus tax). After Russell Brower, the second special guest will be: Jack Wall! ASCAP award-winning, BAFTA nominated, best known for his video game scores (as in Call of Duty: Black Ops, Mass Effect, and more to the point, Myst III and IV). This year’s shirt will sport Xemylixa’s design on the front and calumTraveler’s design on the back. Besides the hotel, the registration to the convention itself is also open: from now until June 1, you can purchase a weekend registration for $35 or a premium registration (weekend + shirt + coloring book) for $60. After June 1, the price will increase and shirts/books will not be available. The Committee is also collecting memories from past editions, to be displayed in some fashion. Shokhootahn Rehn is in the process of moving, so there will be no daytime classes until further notice. They should return sometime in June. The Guild of Instructors’ Hood will be open and public; Rehn will announce the availability of classes on the Hood imager. Two more students who have completed the 101 class; due to the afore-mentioned issues, Rehn has not been able to grade them yet, but will do as soon as possible. Story Nights – Europe will continue with the events from The Book of Atrus. Original Story Nights will continue with the events from The Book of D’ni. Due to Easter weekend, there will be no Story Night – Europe on Saturday 20. Rehn’s actual move will be towards the end of the month, so there may or may not be a story on Saturday 27. The 23:30 events are unaffected, but thunderstorms can cause power outages; in that case, r’Tayrtahn will try to contact someone from the regular audience, so they can relay his situation. For Story Nights – Europe, the gatherings are on Saturday starting at 13:30 KIT, with the story starting at about 14:00 KIT. On All Guilds Meeting days, the event will begin at 14:30 KIT or 30 minutes after the end of the meeting. Korov’ev had to close the speaker session announcing the passing of explorer Dichromus. He and explorer Zeddy celebrated 5 years of marriage last year. He was instrumental in preserving karaoke songs by founder Sil-Oh-Wet and regularly played some of her songs at his karaoke shows after she passed away. He was also a musician and singer. And that was it for this month. Don’t forget to donate to keep the Cavern open! 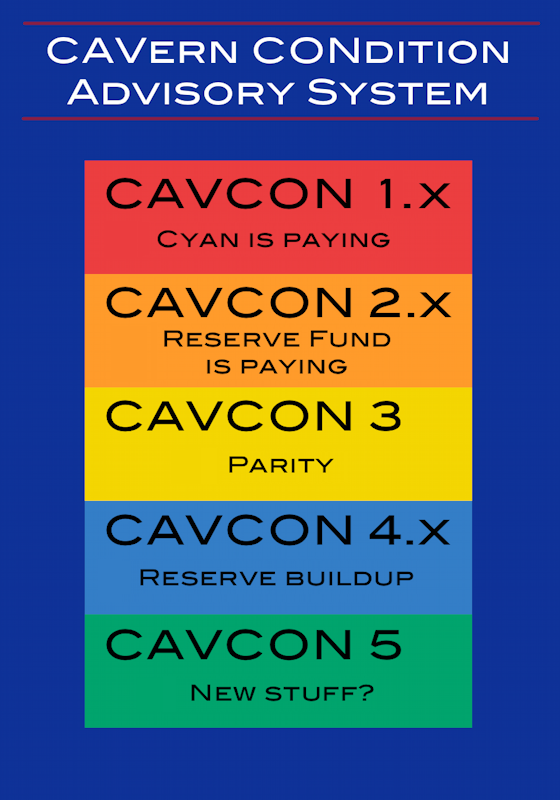 The CavCon status has not been updated yet; internal sources assure that the situation is good, but that can only continue with your help. The next All Guilds Meeting is planned for Saturday, May 11, 2019 at 13:00 KIT.